HAPPY 2ND BIRTHDAY TAP DAT APP™! Although the blog is currently inactive, the Tap Dat App™ brand has lasted on, marking another momentous occasion of sticking around for 2 whole years now! But don't worry, we're not gone for good. I have quite a few exciting things planned for the revival of the name you know and love, including some heavy post-production processes in-place thanks to a few really courteous friends! Please Follow Me on Twitter (@TapDatApp) to Join-In the Festivities as the account reaches nearly 1000 Followers! I'll be giving away an iTunes Giftcard and some other fun goodies as soon as this happens as well as slowly announcing some new TDA Projects/Activities and you don't want to be left out! Touch Pets Cats by ngmoco, Inc.
Touch Pets Dogs 2 by ngmoco, Inc.
shopkick - Play, Collect, Get Discounts! by shopkick, Inc.
And that's it! We've officially named 20 Apps as the Most Significant of 2010! Thank you so much to all of our Sponsors & Fans for making this such an Awesome Year for the Whole Tap Dat App™ Team and We Hope that 2011 is Even Better! HAPPY 1ST BIRTHDAY TAP DAT APP™! 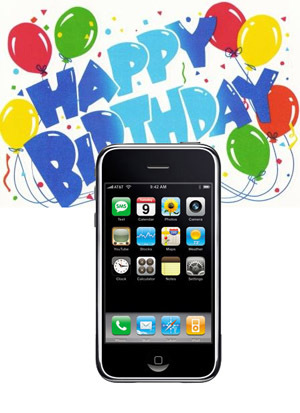 HAPPY BIRTHDAY TAP DAT APP™! Well after a long time of app reviewing, promo code giveaways, and interactive twittering, I'm proud to announce that Tap Dat App™ is Now Officially One Year Old! We've had a great time being part of the iCommunity and we're looking forward to even more fun in the time to come! Here's to another fantastic year at Tap Dat App™! Please Join Us on Our Twitter (@TapDatApp) to Help Celebrate! We will be hosting promo code giveaways, contests, and all sorts of fun events, so don't miss out! Tap Dat App™ EXCLUSIVE INTERVIEW with Will "Cyrus" Powers - Winner of 'The Tester'! How did you get the nickname Cyrus (or as seen on other places around the web, "UNCyrus")? Did you ever consider a career in gaming before you sent in your audition tape for 'The Tester'? I have been trying to get into the gaming industry every since I graduated from college in December 2008. However it's hard to find an opportunity on the west coast, and with the economy the way it's been, there haven't been too many options. Oh of course, I knew what a tester's job was when I applied for this competition. I know that it's not all 'fun and games' per say, however it really is a foot in the door into an industry that I have a lot of passion for. For many people who have a career in the Gaming Industry, like with Dave Jaffe (Director of the hit game 'God of War'), Game Testing is simply the starting point, if this is the case with you as well, what would be the ultimate position or field in the gaming career that you would like to work as for Sony PlayStation eventually? If you watch episode 8, then you get an idea of where I want to head in this industry. Right now I'm looking at a path into the localization department. Obviously being a game enthusiast, we assume you knew about people like Kevin Butler (Vice President at PlayStation) before you were on the show, so do you feel nervous about being intimated or awkward around any well-known PlayStation employees once you start your job there? No, that's actually going to be a perk. Because I feel like the people I'm going to be working with will already feel like they 'know' me. Now it'll just be my job to get to know them too. Were you allowed to tell anyone (such as your immediate family or close friends) about winning the job at PlayStation before the Finale of 'The Tester' aired? Was it hard or frustrating at all to keep it a secret? According to my NDA's I wasn't allowed to tell anyone, however that's absurd not being able to tell your own immediate family since the prize involved me moving across country. It was really hard for me to sit on this secret for 6 months. HomlyRocket on the PlayStation Network asks, "Do you have any plans on what you are going to use the $5000 Signing Bonus on?" Unfortunately that $5000 signing bonus has covered my moving expenses to relocated to San Diego, not much more. Is there any one specific moment from the show that you really wish had been included in the final cuts of 'The Tester' episodes? Hahaha, yes! During the outtakes you got a hint at it. But there was a dance-off / battle on the first day that we were on set. And I did the white-boy-tornado. If you don't know what it is... look it up. We cover a lot of app related stuff on our website so we just have to ask: Do you own an iPhone, iPod Touch, or iPad? Regardless, do you have a certain view on current and future gaming for the iDevice platform? And with that being said, albinopanther on the PlayStation Network asks, "Do you play games on multiple systems or are you a strictly PS3-kind-of Guy?" I have an iPod touch and a Droid phone. However I really don't use them for gaming that often. I'm more of a traditional gamer and hardly like to do it with portable devices. I play games on multiple platforms, however my console of choice is by far the PS3. Last, but certainly not least, do you know of any possible explanation behind the furniture item available in the PlayStation Home Theater called "Tester: Sneakered Monkey" with the description "Guaranteed not to fling poo."? We have no idea how this item relates to 'The Tester' (unless it is some type of inside joke or something that got cut from the show) and it just seems so misplaced and bizarre haha. Great question! The producers of the show gave our bio's and audition tapes to some product designers in the PS Home team and they came up with some objects that loosely related to the cast... IE the surgeon scrubs for Doc, etc. That's All For The Tap Dat App™ EXCLUSIVE INTERVIEW with the Winner of 'The Tester', Will "Cyrus" Powers! We wish Will the Best of Luck at his New Job as Sony PlayStation's Next Game Tester, which he starts on April 19th! Appload™ #8 - Angry Birds, Charadium, Where To?, & MORE!!! We hope you are enjoying TDA & for the record, we recently did a bug fix optimization for the entire website and cleared up any possible problems that might occur for you, so enjoy your enhanced site experience! For the latest updates on Ngmoco:), Freeverse, and More - Follow @TapDatApp on Twitter. "NOBY NOBY BOY" is a game, originally on the PlayStation 3 Console (and much different from the iPhone version), from Keita Takahashi, the creator of the Katamari Damacy series, where you control and play around with a worm-like stretchy character referred to as "BOY". But unlike the PS3 version of Noby Noby Boy, the iPhone OS Version is not in 3D and is not an open world experience. Instead, you are given multiple tools in what appears to be some type of "toy box" that simulates an iPhone Springboard (Home Screen) like Experience except with your friend BOY hanging around all the time. The app takes advantage of the multiple features of the iPhone (isn't half as fun on an iTouch) to provide fun-like situations that help you manipulate your usage and boredom-filling time with BOY. Noby Noby Boy for iPhone is really hard to judge. The only fair statement you can give about it is that "It's Weird" and that goes without question, but good weird? or bad weird? Well I've played Noby Noby Boy for PS3 which is essentially more of a cool concept idea than an actual game, but it is definitely different and definitely weird. There are things I like about it, and other things that I don't. But overall, it's pretty interesting to say the least. Noby Noby Boy for iPhone is also..."interesting". But it doesn't stay interesting for the amount of time the PS3 title does. And although it is not as frustrating as Noby Noby Boy for PS3 originally is, it feels very useless. Which would be fine...if it was constantly fun. The problem is even if you love the crazy concepts of Noby Noby Boy, the graphics are boring 2D and the features just simulate an iPhone springboard to act as a really strange toy box for some wacked up stuff. At first, some of these things can actually be cool to explore and play around with, like in Noby Noby Boy for PS3, but it gets very boring very fast and you realize it isn't an app you will play when you are bored, because it will only make you even more bored.